Our Drive-Thru heavy aluminum signs are made with .080" aluminum, 1.5" radius corners, yellow 3M Reflective yellow Scotchlite, 3M best quality solvent screen printed black image, 3M reflective red plaque and 3M reflective white numbers. A typical configuration is a 24" x 18" Top Sign over a 12" x 48" Post Sign. 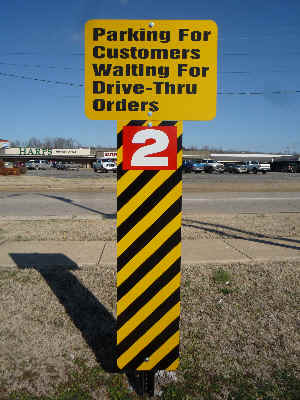 The Post Sign typically has a reflective number plaque when there is more than one parking spot designated for Drive Thru Waiting. Custom signs are also available - send specifications and we'll send you a no-obligation proposal by fax or E-mail.